Solar Electric: If utility power fails, your inverter(s) will cease to produce power and your system will shut down automatically. 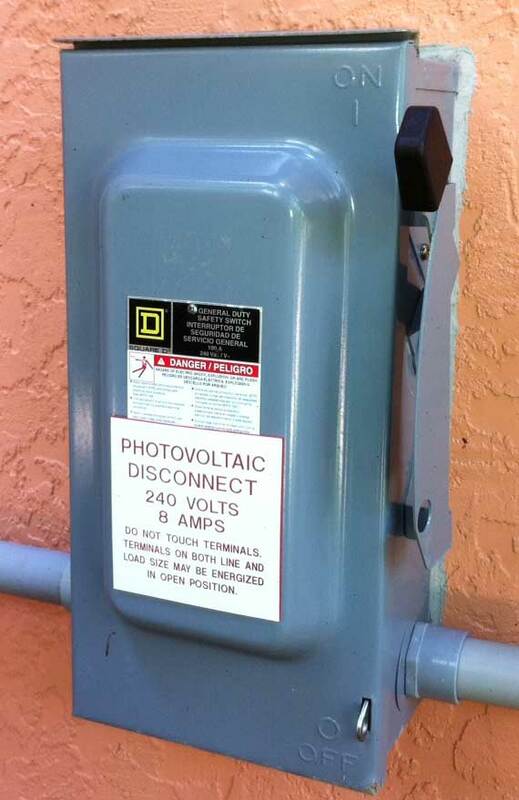 For an added layer of safety you may wish to shut your system off manually by turning off the main photovoltaic disconnect switch(es). This switch should be near you utility meter. If not, a sign near the meter should show its location. If your system was installed in the last few years, it is likely installed per Florida Building Code 2007, which provides for secure attachment to the roof structure with design wind speeds from 120-140 mph depending on your location in Southwest Florida. It is likely that your roof would come off the house before the panels come off the roof (not that this is any consolation). After the storm, do not handle any damaged solar electric modules. There may be high DC voltage that is extremely dangerous. Treat damaged solar modules like live utility wires. Contact your solar dealer for an inspection if any storm damage is observed to any equipment. Solar Pool Heating: Turn your pool pump off manually. To be sure, turn off the pool equipment at the circuit breaker. You may have a breaker for the pool pump itself or a breaker for a pool subpanel. Turning off all sources of power is usually the best option. 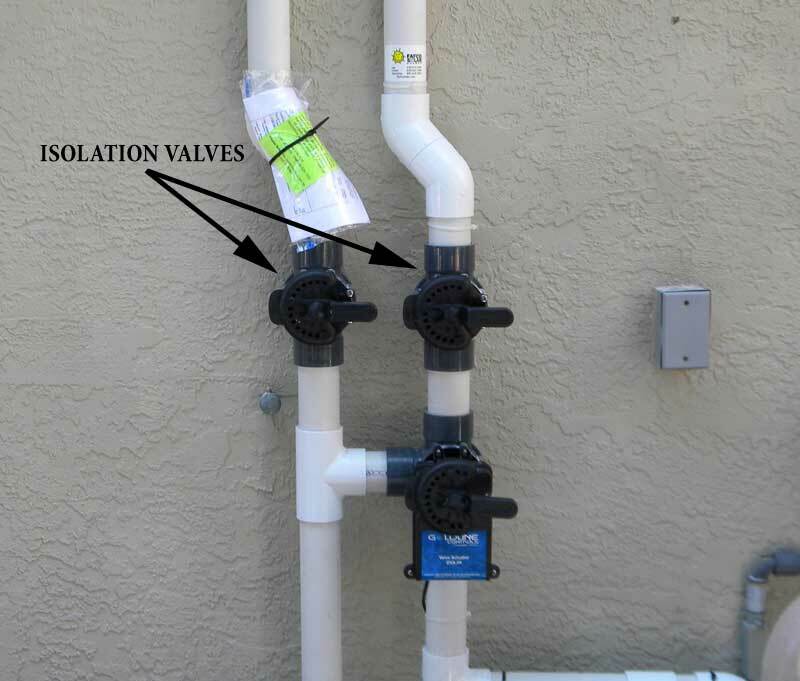 If you choose to not turn off power to your pump, you should have isolation valves installed in your plumbing that allow you to stop water flow to the roof mounted panels. Turning these valves off manually so that water cannot be pumped to the roof is a good idea. To the right is a picture of a typical solar pool heating manifold. The valves pictured are open. You want the handles to follow the pipe to be closed. 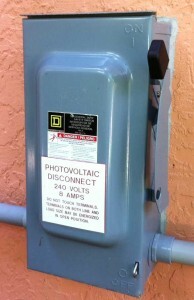 The third valve pictured is a diverter valve, and should remain in the solar off position to bypass the solar loop. If you have an electronic controller, set the solar to manual off. Consult your manual or contact us for assistance. Note: Your valves may be a different style, and may have red handles. Red handled ball valves are closed when perpendicular to the pipe and open when parallel to the pipe. Solar Water Heating: There are many variations with solar water heating systems, so it is best to contact your dealer to determine your system type and the best way to protect yourself and your investment. In general, turn off power to your circulation pump and close your home’s main water valve (which is a good idea even without solar water heating). Remember that water inside the solar collector may be extremely hot and can cause scalding in a fraction of a second. If you are capable of draining your system and know how to do so, this is a good precautionary measure. Drainback-type systems drain the heat transfer fluid into a reservoir when the system is off, so no action other than disconnecting power to the pump is required. All Solar Products: Most insurance policies cover all solar products that we install. If you have storm damage to any solar energy product, notify your insurance company and call us immediately for a repair quotation. You should treat your solar investment like any other appliance or part of your home. Insurance companies may not be qualified to assess the cost of repair for solar energy products, so it is important that you contact a professional to assess damage. We have excellent experience in handling storm damage repairs and replacements, having been there to support customers after Hurricane Charley. The solar industry recovered quickly after past storms, and many systems in the direct path of storms held up without any damage whatsoever. More Answers: We are often inundated with calls when storms are approaching, but we will do our absolute best to answer your questions. Contact us, or post your questions here in the comments!